I was just tagged by Vehige at Thursday Night Gumbo. Now, the correct title of this meme is "5 Random Things About Me!" 1. I collect Nightmare Before Christmas stuff. 2. I can watch the same movie back to back many times over, up to 8 or 9 viewings, Check out my Movie List. 4. When I find an author I like I try and read evrything they have published. I tag the following Relapsed Catholic, Irish Catholic and Dangerous & Bics, Blahniks and Bras. P.S. Afterthought, 6. I love School and Learning and if I was wealthy I would go to school till I die. 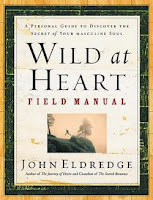 This is the field manual for the book Wild At Heart. Mine is very worn from having been worked through 4 times. 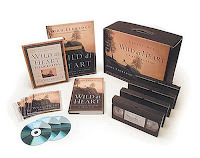 This is a great resource if you are working through Wild At Heart, either by yourself or in a group. It will help you really examine and work through the book. Each chapter which parallels the book, begins with a 'Gut Reaction' - what is your first take on that chapter in the book? This helps set the bearings for where you will go in that chapter. As you work through it you will be drawn deeper and deeper into the masculine journey. Eldredge begins each chapter with quotes that span church history and denominations. He must be one of the most widely read men I have encountered. He draws from that breadth of knowledge to show a variety of views on topics and tries to help you see where God is wanting to work in your life. The one drawback, if you use it in conjunction with the DVD curriculum, is that the DVD does not follow the book exactly, and with 12 chapters in the book and field manual that follow each other exactly, and 8 in the DVD, it doesn't seem weighted evenly. The Field Manual is indispensable if you are going to work through the DVDs and is a great supplement to the original book. For you, or other men in your life, this book will be a great tool on your journey to authentic Christian manhood. Some books defy almost all categories. This is definitely one of those books. It is a book of hope, dreams, encouragement and support, for those who lost so much in Hurricane Katrina. This book is the brainchild of Naomi Strasser who, along with photographer friend Paul Alexander, decided to create art that would help in some small way to heal. Alexander donated his time in photographing celebrities from around the world and from different strata of society. Many others contributed to the work, from the stylists working with the celebrities, to Ryan Priest doing the design and layout. This book was the work of the generosity of many, many people who all championed it and gave of their time and talents to make it happen. The book is a collection of 71 unique portraits of celebrities, from Johnny Depp, Kelly Hu, and Coldplay, to Viggo Mortensen, Helen Bonham Carter and so many more. Accompanying each portrait is a letter, or encouragement note, to encourage the giving to continue. And it is for those who are far from home now, that they should keep hoping and dreaming of their return. Interspersed with photos of the actual devastation from Katrina, these notes provide hope, encouragement and support. From Johnny Depp who writes “Help and Keep Helping”, to Helen Bonham Carter stating “No amount of rain can drown the music of New Orleans”, the words will challenge us to appreciate what we have and to help those less fortunate than we find ourselves to be. The publisher, Naked Ink Press, is doing their part as well; they have committed to give at least $25,000 US dollars to both the American Red Cross Disaster Relief Fund and to Habitat for Humanity’s Operation Home Delivery. That is $2.50 from each book, sold for a minimum of $25,000 each more depending on sales. It may be trite, but giving this book as a gift, will be a gift that keeps on giving. This is one of those books that I have wanted to review for a while, but was unsure of how to approach it. I love the book and have read it over a half dozen times in less than two years. Yet it is such an atypical book that it is difficult to review. I can just be blunt and state that the book will grab you and draw you back in again and again. Every time I pick up this book, I get something more out of it. Sometimes I read it from beginning to end, and then at other times I just pick it up and read at random. This book deals with many of the 'big' questions all of us will have to deal with in our lives. Questions like: How do we deal with Loneliness? Anxiety? Failed relationships? How can we find quiet in our lives? It also deals with the question of being raised without a religion or belief system and how, as we age, we end up struggling with spiritual questions. If you can track down the first edition hardcover it is worth it. It is in a different format and shape. With the dust jacket off, it looks like a prayer book or bible. If you read it without the jacket in public places people will often ask you what you are reading. This was intentional and the shape and design of this book are part of the art of the book, and part of the complexity Coupland has woven into it. The front cover of the hardback also has an outline of a hand, like a tracing of a child's hand. As we are all reaching out beyond ourselves in search of some greater meaning in life, we are reaching out like a child in search of a parent. My hat is off to Coupland and this amazing work of art - on all the levels that it is art of the deepest level. Coupland has created a masterpiece that will become a classic, which will survive through the ages. This will be the first of a series of reviews of Catholic Publishers and Publishing houses. I will highlight their area of expertise and, to my knowledge, some of their better offerings. 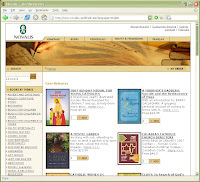 Novalis is the largest of the Canadian Catholic Publishing companies. They publish in both English and French, and have a wide range of books on a wide range of topics. Because they are the largest Canadian publisher, they are not nearly as specialized as many of the publishing houses south of the border or around the world. The authors I would recommend are Michael W. Higgins, and Irma Zaleski. Novalis is also the Canadian distributor of many of the American Catholic Publishing Houses here in Canada. Scepter is one of the publishers whose works I have been reading a lot of lately. They are the North American distributors for Scepter UK, Four Courts and a few others. These books specialize in the Spirituality of Opus Dei; they have numerous editions of all the books by St. Josemaria Escriva, and by many authors who are members of Opus Dei. I have yet to read anything from this publisher that was a disappointment. Besides the works of St. Josemaria Escriva, I would highly recommend Edward G. Maristany and Federico Suarez. 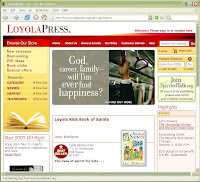 This is one of the larger Catholic Publishing Houses. They have a great website that is easy to navigate and have a lot of resources available. I would highly recommend the writings of Liz Kelly, and the Seeker's Guide Series. This is an organization dedicated to what they call Media Evangelization. They desire to use all the means that modern technology has - books, magazines, music, radio, videos, and the internet - to communicate the Gospel of Jesus Christ. Well that is a start. Next week I will try to profile a few more for you. Seldom do I come across a book that turns me off so quickly, and so completely, as this book did. For a little over a year I have been researching Opus Dei with the goal of doing my Thesis on the organization. If even a tenth of what this book claims is true, then this group is the best in the world at keeping secrets, and the people I have known who are members are great deceivers, better than what the devil himself is given credit for being. The cover of the book claims: "A responsible piece of investigative reporting … packed with meticulous detail." from Publishers Weekly. Yet I find none of that in this book in comparison with other books on the same subject. Both this author, and Michael Walsh in his book The Secret World of Opus Dei, claim to have access to secret documents that are not reproduced or evidenced other than their claims given to their existence. Hutchison claims that Josemaria Escriva, the founder of Opus Dei, was not really interested in the spiritual life of his followers. 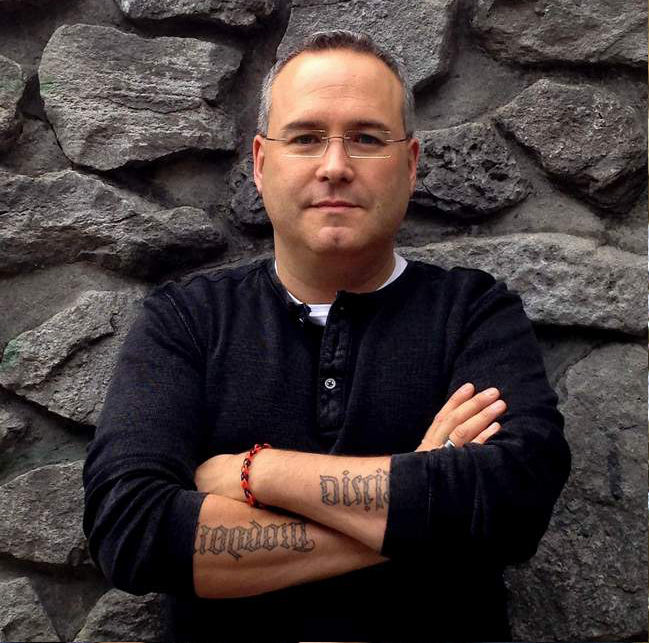 He states: "Escriva was interested in power. He was a schemer. God's schemer. And he wanted to control higher education, and later government ministries." p.87 This book makes such wide and varied accusations against Opus Dei that it is hard to believe the author has not been charged with libel and slander. Hutchison claims that Opus Dei has overturned governments, controlled the FBI and the CIA, bankrupted the Vatican so that Opus Dei could bail them out, and orchestrated assassination attempts including the one against Pope Paul VI. He even went so far as to claim that Opus Dei controls the majority of the Clergy and Laity in the Roman Curia and that they even actively r ecruit in the Pentagon and other government organizations around the world to achieve the power and control they want. Hutchison even alludes to the fact that Pope John Paul II was really just a puppet for Opus Dei; he calls JPII Opus Dei's Pope. How this book is published as Non-Fiction and not Fiction I will never know. Of the 30 odd books I have read, both for and against Opus Dei in the last year, this book is definitely the worst and thus deserves a 'Hate It' book review. If you want to read something unbiased and informative, I would start with John Allen Jr.'s book Opus Dei: An Objective Look Behind the Myths and Reality of the Most Controversial Force in the Catholic Church. It is worth the read. But this book by Hutchison is trash and does not deserve your time, effort or hard-earned money. Sometimes when I start to read a book, I know it will be so good I do not mark in it the first time I read it through. This series falls into that category. However, this being my second time through these books, I am now underlining, making notes in the margins and reading much deeper than my first time through last year. As such, I will just state that these are awesome devotional books and deserve the time and attention of a 6 or 7 page devotion each day. They will help you grow closer to Christ, and through that, to the other people in your life. This volume spans the time from the first Sunday of Advent till either January 12th or the Second Sunday after the Ephiphany. Thus this book has 51 devotions for this joyous Church Season. If you cannot afford the whole set, start with this volume or the Lent and Eastertide volume, then add the others over time. 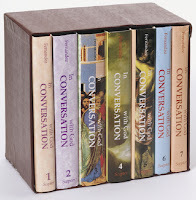 It is usually cheaper to buy the boxed set but sometimes that amount of money is not available up front. These are but a few of the Gems in this book that I found this year. And I am sure that next year will have just as many. Hopefully these samplings will whet your appetite for these great books. The complete series is worth the money, time and effort. This is an amazing Catholic meditation and daily reflection series. The seven volumes have daily readings for each day of the church year, as well as volumes 6 & 7 being special Feast Days. The readings draw heavily upon the writings of Josemaria Escriva the founder of Opus Dei, Pope John Paul II, and the daily readings from the common liturgy for that day. The Sundays have three sets of readings, depending on whether we are in year A, B, or C in the church readings. These devotions are all about 6 pages long and divided into 3 sections. They can all be read as a complete section, or part in the morning, midday and evening to cover each of the three sections. I find that with every day, there is so much meat in these devotions that I am already planning on reading them again next year. There is a complete subject and biblical reference index in volume 7; unfortunately the earlier volumes' indexes only go as far as that volume #. The indexes are subject and reference quoted by church Fathers, Popes and Saints. These books will draw anyone deeper into a faith, and a life of action based upon that faith. It was an open Tag on Irish Catholic and Dangerous! Those who read this blog and would like to consider yourself tagged. 1. Favorite devotion or prayer to Jesus. 2. Favorite Marian devotion or prayer. I wear a rope rosary around my neck with a St. Patrick's Medal. I have recieved a 5 fold scapular and a brown scapular. But am as of yet undecided about wearing them. I also tend to colect Rosary's and end up giving them away, of my whole collection only 3 are more than 4 years old, as I give them away and then replace them. 5. Do you "offer up" your sufferings? I have off and on. Corrently more off. I try and do a visit weekly. When I was at University the first time I used to do 4 hours a week. Now It is inconsistent. 8. Are you a Saturday evening Mass person or a Sunday morning Mass person? Both, depends on wife's work schedule and access to a car. Irish Saints, Patrick, Bridget and Columba. 11. Can you recite the Apostles' Creed by heart? Yes since I was a child. Nicene not so much any more. 13. Bonus Question: When you pass by an automobile accident or other serious mishap, do you say a quick prayer for the folks involved? Added bonus question: Have you named your Guardian Angel? I did not but my spiritual director years ago told me their names. Shelly's Bookshelf asked the following question. Which is the story of a woman's struggle with faith, doubt, and lupus. A great book where one women share's what she really loves about the Catholic tradition. An awesome book, that is really hard to describe. I have linked to my reviews of each of these three. It was really hard to narrow the list to 3. It would have been easier to choose 3 fiction and 3 non-fiction, but that was not the question given. Yes this is a review of the 6th and final installment in the Rocky saga. Rocky has been called the greatest underdog story of all time. It has been given two thumbs up by Elbert & Roeper; it has been given rave reviews and is currently 3rd in box office holiday season sales. With all of that, why would Imprint review this movie as well? The answer to that question is how the movie is relevant to students. Rocky Balboa is called a truly inspirational story. It is the story of a man who has had it all, lost most of it and rebuilt what he could. The film was written, directed and starred in by Sylvester Stallone. But this story is older than even that. For Stallone wrote the first Rocky story and held on to it for years. He would not sell it because no one would let him star in it. With his perseverance and determination, he held onto the script until he could play the role of Rocky. In this film, Rocky is again the underdog. He is 53, retired, and running a restaurant. He is also widowed, and looking for something more in life. He decides to try and fight again - he is thinking something local, for charity. And yet he is given a shot at the champ. This is a story of overcoming - the story of living your hopes and dreams. It is about believing in yourself and following those dreams. Rocky states: "What is it you said to the kid? The world ain't all sunshine and rainbows. It's a very rough, mean place... and no matter how tough you think you are, it'll always bring you to your knees and keep you there, permanently... if you let it. You or nobody ain't never gonna hit as hard as life. But it ain't about how hard you hit... it's about how hard you can get hit, and keep moving forward... how much you can take, and keep moving forward. If you know what you're worth, go out and get what you're worth. But you gotta be willing to take the hit." And he lives that in this film. Yet Rocky is not the only character to face this adversity in this film. Paulie, his brother-in-law, who only has his work and alcohol is laid off from his job. Rocky's son Robert has lost his way, and is trying to not live in his father's shadow. And each of these three men must deal with their grief at the loss of Adrian, who was wife, sister and mother to these three men. Rocky must also face his aging body. In the beginning of the training sequences he realizes that this will not be the simple battle of determination to get the body in shape. It will be in part mind over matter as he must reconquer and retrain his body to be that of a fighter. Rocky's opponent Mason "The Line" Dixon (played by actual former heavyweight champion Antonio Tarver) does not take the fight seriously, he has the youthful disregard and disrespect for age and experience that Rocky will bring to the ring in this battle of athletes from different eras. Rocky Balboa will motivate us to face our own challenges with perseverance and a community for support, and with hope and by prayer. The story will promote discussions about where we find our courage, what we want from life and how we can overcome loss and yet stand strong and remain faithful. It will also help us to classify what we call a victory. Rocky is not just another boxing movie, or even just a sport movie, and it is definitely not just a squeal. It is a movie that will help you find the courage to follow your dreams and encourage you to pursue hopes. So when the world knocks you down, you can either lay there or get up. That is what Rocky Balboa teaches us.